Background: Gall (Galla Rhois [GR]) is known to have antibacterial, anti-inflammatory, antimetastatic, and anti-invasion activities and exert hepatoprotective effects. However, the hepatoprotective effects of gallotannin-enriched GR (GEGR) and their mechanisms have not yet been investigated. Objective: The potential protective effect of GEGR against hepatotoxicity induced by hydrogen peroxide (H2O2) was investigated. Materials and Methods: Changes in cell viability, apoptosis protein expression, and reactive oxygen species (ROS) generation were determined in HepG2 cells that were pretreated with four different concentrations of GEGR (6.25–50 μg/ml) for 24 h before H2O2exposure. Results: GEGR consisted of gallotannin (69.2%), gallic acid (26.6%), and methyl gallate (4.2%) and showed remarkable 2,2-diphenyl-1-picrylhydrazyl scavenging activity (inhibitory concentration 50% = 0.212 μg/ml). The lethal dose 50% and effective dose 50% values for the response of HepG2 cells to GEGR were determined to be 178 and 6.85 μg/ml, respectively. Significant reductions in the immunofluorescence intensity indicating apoptosis were also detected in the nuclei of HepG2 cells stained with 4',6-diamidino-2-phenylindole and Annexin V after GEGR treatment. The Bax/Bcl-2 ratio and active caspase-3 level were higher in H2O2 + vehicle-treated cells. However, these levels gradually decreased to those of the No-treated group in the GEGR pretreated group even though little or no decrease was observed in response to low GEGR concentrations. Furthermore, the GEGR pretreated group showed a reduced level of 2-′,7-′-dichlorofluorescein diacetate stained cells, indicating ROS generation relative to the H2O2 + vehicle-treated group. 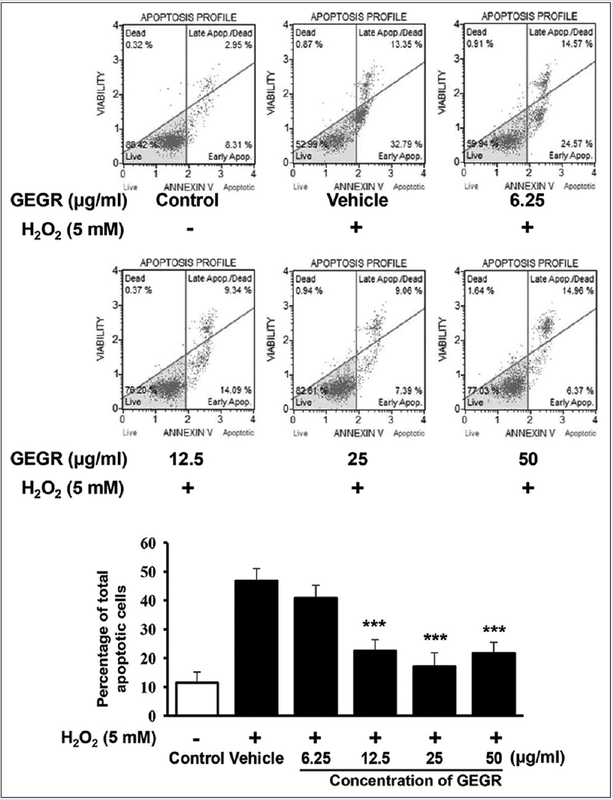 Conclusion: The results of this study provide strong evidence that GEGR can prevent cell death induced by H2O2in HepG2 cells through the induction of antioxidant conditions. Abbreviations used: COX: Cyclooxygenase; DAPI: 4',6-diamidino-2-phenylindole; DMSO: Dimethyl sulfoxide; DPPH: 2,2-diphenyl-1-picrylhydrazyl; GEGR: Gallotannin-enriched Galla Rhois; GR: Galla Rhois; HPLC: High-performance liquid chromatography; H2O2: Hydrogen peroxide; MMP: Metallopeptidase; MTT: 3-(4,5 dimethylthiazol-2-yl)-2,5-diphenyl tetrazolium bromide; ROS: Reactive oxygen species; UV-Vis: Ultraviolet-visible. GEGR pretreatment showed protection against H2O2-induced ROS production in DCFH-DA staining analysis. Gall (Galla Rhois [GR]) is the excrescence formed by parasitic aphids, primarily Schlechtendalia chinensi s Bell, on the leaves of the nutgall sumac tree, Rhus javanica L. (Anacardiaceae)., GR has long been used as a traditional Korean medicine for the treatment of diarrhea, seminal emissions, excessive sweating, bleeding, and chronic cough although there is little scientific evidence supporting these pharmacological effects.,, Recent studies have revealed the therapeutic effects of GR against various human diseases and their mechanisms. For example, several compounds and extracts purified from GR exhibited good antibacterial activity against many pathogenic bacteria strains including Salmonella spp., Escherichia coli, Eimeria tenella, Brucella abortus, Staphylococcus aureus, and Clostridium perfringens.,,,,, Methyl gallate and ethyl gallate isolated from GR were also found to exert significant anti-inflammatory activity in lipopolysaccharide-stimulated RAW264.7 macrophages through the induction of heme oxygenase-1 and the suppression of inducible nitric oxide synthase/cyclooxygenase-2 (COX-2)., Moreover, galloylglucose (GG6-10) isolated from GR inhibited the invasion of metastatic HT-1080 cells into a reconstituted basement membrane through inhibition of gelationolysis mediated by matrix metallopeptidase (MMP-2) and MMP -9, whereas the ellagic acid extracted from GR showed anticancer activity against nasopharyngeal carcinoma cells through downregulated expression of COX-2 and stathmin., Furthermore, oral administration of GR 85% methanol extract reduced brain infarct volume by 37.5% and lipid peroxidation in middle cerebral artery occlusion, while also improving sensory motor function in a transient focal cerebral ischemia rat model. Moreover, tacrine, nitrofurantoin, and tert-butyl hydroperoxide-induced hepatotoxicity in HepG2 cells were greatly alleviated by two hepatoprotective constituents of GR, an equilibrium mixture of 3-galloyl-gallic acid (3GGA), 4-galloyl-gallic acid isomers (4GGAI), and 1, 2, 3, 4, 6-penta-O-galloyl-β-d-glucose (PGG)., However, more studies are needed to determine the novel functions and mechanisms of GR extract in hydrogen peroxide (H2O2)-induced hepatotoxicity. In this study, we investigated the hepatoprotective effects of gallotannin-enriched GR (GEGR) on H2O2-induced hepatotoxicity in HepG2 cells. The results provide novel data indicating that GEGR may associate with protective hepatocytes during apoptosis. Samples of GR were collected from plantations in the Hongcheon area of Korea in October 2013 by Professor Young-Hee Lee, then dried in a hot-air drying machine (JSR, Seoul, Korea) for 24 h at 60°C. Voucher specimens of GR (WPC-14-001) were deposited in the functional materials bank of the PNU-Wellbeing RIS Center at Pusan National University. GEGR was prepared using the modified extract quoting method as previously described.,,, First, dry samples of GR were reduced to powder using an electric blender. Water extract was then obtained by placing the powder in a fixed liquor ratio (solid GR powder/water ratio, 1:10) and heating at 90°C for 9 h using circulating extraction equipment (IKA Labortechnik, Staufen, Germany). The extracts were subsequently filtered through a 0.4 μm filter, after which they were concentrated by vacuum evaporation and lyophilization using circulating extraction equipment (IKA Labortechnik, Staufen, Germany). Finally, the powder of GEGR was dissolved in distilled water (dH2O) to 1 mg/ml, then further diluted with phosphate-buffered saline (PBS) to the required concentration. During analysis of the main components of GEGR, gallic acid monohydrate, methyl gallate, and gallotannin were purchased from Sigma-Aldrich Co., St. Louis, MO, USA. The wavelengths of the maximum absorption of pure gallic acid, pure methyl gallate, commercial gallotannin, and nutgall extract were 212/257, 214/268, 213/278, and 212/275 nm, respectively. The ultraviolet-visible (UV-Vis) spectra of pure gallic acid, pure methyl gallate, pure gallotannin, and the nutgall extract showed two bands at 212–214 and 257–278 nm, which were both assigned to the π→π* transitions of the given aromatic units and C=O groups in the UV-Vis region. Finally, the UV-Vis spectra were analyzed using a curve-resolving technique based on linear least squares analysis to fit the combined Lorentzian and Gaussian curves. The high-performance liquid chromatography (HPLC) analysis was conducted as previously described. The HPLC system used for these experiments consisted of a Summit Dual-Gradient HPLC System (Dionex, USA) with a photodiode array UV-Vis detector at the Korea Bio-IT Foundry Busan Center. Separation was carried out on an YMC-Triart C18 column (S-5 mm/12 mm, 150 mm × 4.6 mm I.D.) maintained at 40°C. The mobile phase consisted of solvent A (0.4% formic acid in water) and solvent B (acetonitrile). The gradient condition of the mobile phase was as follows: 0–5 min, 10% B; 5–6 min, 10–15% B; 6–40 min, 15% B; 40–41 min, 15–30% B; 41–50 min, 30% B; 50–55 min, 30–10% B; and 55–60 min, 10% B. The injection volume was 5 ml in full loop injection. The flow rate was 0.8 mL/min, and detection was performed at 280 nm. The scavenging activity of 2,2-diphenyl-1-picrylhydrazyl (DPPH) radical was measured as previously described. Briefly, the powder of GEGR was dissolved in 50% ethyl alcohol (100 μl) in 13 different concentrations (0.122–500 μg/ml) and mixed with 100 μl of 0.1 mM DPPH (Cat. No. D9132, Sigma-Aldrich Co.) in 95% ethanol solution or 100 μl of 95% ethanol solution, then incubated for 30 min at room temperature. Next, the absorbance of the reaction mixture was measured at 517 nm using a VersaMax plate reader (Molecular Devices, Sunnyvale, CA, USA). The DPPH radical scavenging activity of the GEGR was expressed as the percent decrease in absorbance relative to the control. The inhibitory concentration 50% (IC50) value is defined as the concentration of substrate that causes a 50% loss in DPPH activity. The HepG2 cell line was purchased from the Korean Cell Line Bank (Seoul, Korea) and grown in a humidified incubator at 37°C under 5% CO2 and 95% air in Eagle's minimal essential medium with Earle's balanced salt solution (MEM/EBSS, Cat. No. SH30024.01, Thermo Scientific, Waltham, MA, USA) containing 10% fetal bovine serum, 2 mM glutamine, 100 U/ml of penicillin, and 100 μg/ml streptomycin. HepG2 cells treated as described above were further treated with 5 mM H2O2, then incubated for another 12 h, after which the cell viability was determined using the tetrazolium compound 3- [4,5-dimethylthiazol-2-yl]-2,5-diphenyltetrazolium bromide (MTT) (Cat. No. M2128, Sigma-Aldrich Co.). To determine cell viability, HepG2 cells were seeded at a density of 5 × 105 cells/2 ml of MEM media and grown for 24 h in a 37°C incubator. When the cells attained 70%–80% confluence, they were either untreated (control group), treated with vehicle (dH2O), or pretreated with 6.25, 12.5, 25, or 50 μg/ml of GEGR dissolved in distilled H2O added to each well. Following incubation for 24 h, the supernatants were discarded, after which 2 ml of fresh MEM media and 500 μl of MTT solution (2 mg/ml in PBS) were added to each well. The cells were then incubated at 37°C for 4 h, after which the formazan precipitate was dissolved in dimethyl sulfoxide (DMSO, Cat. No. D1370.0100, Duchefa Biochemie, Haarlem, the Netherlands), and the absorbance was read at 570 nm directly in the wells using a Vmax plate reader (Molecular Devices). Apoptotic cells were detected using a Muse ™ Annexin V and Dead Cell Kit (Cat. No. MCH100105, Millipore Co., Billerica, MA, USA) according to the manufacturer's protocols. Briefly, cells of subset groups were suspended in MEM media (1 × 105 cells/ml), after which 100 μl of the cell suspension (1 × 104 cells/ml) was incubated with Muse ™ Annexin V and Dead Cell Reagent (Cat. No. 12-0563, Millipore Co.) for 20 min at room temperature. After the final incubation, the reaction mixture was analyzed using Muse ™ Cell Analyzer (Cat. No. PB4455ENEU, Millipore Co.). The morphological changes in apoptotic cells were assessed by fluorescent microscopy following DAPI staining. Briefly, HepG2 cells were seeded at a density of 5 × 105 cells/2 ml in 6-well plates, then grown with four different concentrations of GEGR for 24 h in a 37°C incubator. After washing once with ×1 PBS, cells were incubated with 5 mM H2O2 for another 12 h, then fixed in 4% formaldehyde (Cat. No. 69360-0380, Junsei Chemical Co. Ltd., Tokyo, Japan) for 1 h and permeated with 0.1% Triton X-100 (Cat. No. T1020, Biosesang Inc., Seongnam, Korea) for 5 min. Next, the DNA-specific fluorochrome DAPI (100 μM, Cat. No. D1306, Invitrogen) was applied to each well, after which samples were incubated for 10 min in the dark at room temperature. Finally, the cells were washed three times with ×1 PBS and examined using a fluorescent microscope (Olympus IX71, Tokyo, Japan) at ×400 magnification. Intracellular reactive oxygen species (ROS) levels were measured by staining with 2-′,7-′-dichlorofluorescein diacetate (DCFH-DA) (Cat. No. D6883, Sigma-Aldrich Co.), which is a cell permeable and nonfluorescent agent that can be deacetylated by intracellular esterases to nonfluorescent DCFH. In the presence of ROS, DCFH was converted to highly fluorescent DCF intracellularly. Briefly, HepG2 cells were seeded at a density of 5 × 105 cells/2 ml in 6-well plates, then grown with four different concentrations of GEGR for 24 h in a 37°C incubator. After washing once with ×1 PBS, the cells were incubated with 5 μM H2O2 for another 12 h. Next, cells were incubated with 25 μM DCFH-DA for 30 min at 37°C. The cells were then washed twice with PBS, after which the green fluorescence was observed using a fluorescent microscope (Eclipse TX100, Nikon, Tokyo, Japan). Proteins prepared from HepG2 cells were separated by 4%–20% sodium dodecyl sulfate-polyacrylamide gel electrophoresis for 2 h, after which they were transferred to nitrocellulose membranes for 2 h at 40 V. Each membrane was then incubated separately at 4°C with the following primary antibodies overnight: anti-Bax (Cat. No. ab7977, Abcam, Cambridge, UK), anti-Bcl-2 (Cat. No. ab7973, Abcam), anti-Casepase-3 (Cat. No. 9662, Cell Signaling, Danvers, MA, USA), and anti-actin antibody (Cat. No. A5316, Sigma-Aldrich). Next, the membranes were washed with washing buffer (137 mM NaCl, 2.7 mM KCl, 10 mM Na2 HPO4, and 0.05% Tween 20) and incubated with 1:1000 diluted horseradish peroxidase-conjugated goat anti-rabbit IgG (Cat. No. G21234, Invitrogen) at room temperature for 1 h. Finally, membrane blots were developed using Amersham ECL Select Western Blotting detection reagent (Cat. No. RPN2235, GE Healthcare, Little Chalfont, UK). The chemiluminescence signals that originated from specific bands were detected using FluorChemi ® FC2 (Alpha Innotech Co., San Leandro, CA, USA). One-way ANOVA was used to identify significant differences between No- and H2O2-treated groups (SPSS for Windows, Release 10.10, Standard Version, Chicago, IL, USA). Differences in the responses of the H2O2 + vehicle and H2O2 + GEGR treated groups were evaluated using a post hoc test (SPSS for Windows, Release 10.10, Standard Version). All values are reported as the mean ± standard deviation and P < 0.05 was considered statistically significant. 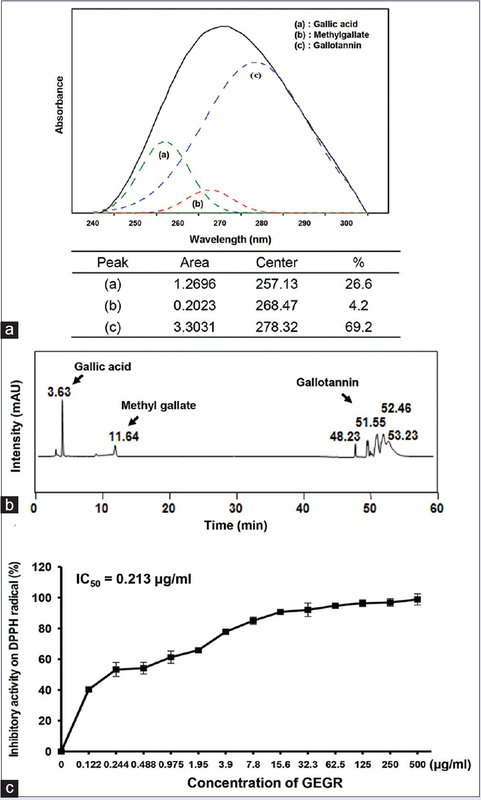 As shown in [Figure 1]a, the fitting curves of pure gallic acid were detected at 257 nm, whereas pure methyl gallate and pure gallotannin were observed at 268 and 278 nm, respectively. GEGR contained high concentrations of three bioactive components related to its hepatoprotective effects, gallotannin (69.2%), gallic acid (26.6%), and methyl gallate (4.2%). HPLC curves of GEGR were found to have three characteristic peaks for gallic acid (3.58 min), methyl gallate (11.44 min), and gallotannin (48.26, 51.55, 52.46, and 53.23 min) [Figure 1]b. Furthermore, GEGR showed a very small peak near 11.4 min, indicating the existence of a small amount of methyl gallate, but a large amount of gallotannin and gallic acid. These results demonstrate that GEGR had a high concentration of gallotannin. To measure the antioxidant activity of GEGR, the free radical scavenging activity of DPPH was analyzed following treatment with various doses of GEGR. The inhibitory activity against DPPH radical was gradually increased by the addition of 0.12–500 μg/ml pf GEGR. Based on these data, the IC50 value of GEGR was determined to be 0.212 μg/ml [Figure 1]c. Taken together, these results indicate that GEGR has very strong DPPH radical scavenging activity and therefore has the potential for use as an antioxidant. H2O2 treatment induces apoptosis through the production of ROS and oxidative stress in various cells., Therefore, we examined whether GEGR pretreatment can prevent hepatic cell death induced by H2O2 exposure. 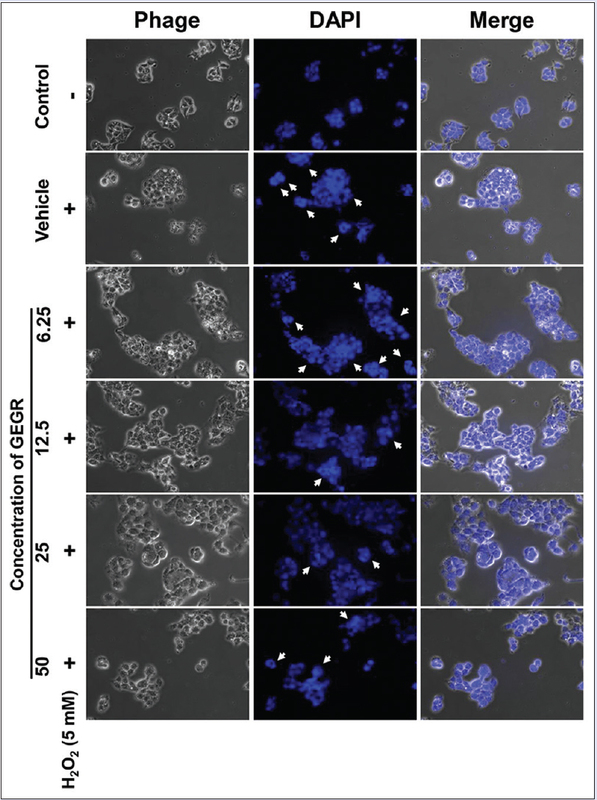 To accomplish this, cell viability was measured in HepG2 cells pretreated with different concentrations of GEGR by MTT assay, fluorescence-activated cell sorter staining, and DAPI staining analysis. Toxicity analysis revealed no significant alterations in cell viability in HepG2 cells pretreated with 6.25 μg/ml to 50 μg/ml of GEGR alone [Figure 2]a, while the lethal dose 50% of GEGR was determined to be 178 μg/ml (data not shown). Overall, these findings indicated that GEGR exerted no toxicity at <50 μg/ml. H2O2 + vehicle-treated cells showed low (53%) cell viability relative to the control group. However, their level was significantly higher in HepG2 cells treated with H2O2 and four concentrations of GEGR although the maximum level remained consistent in response to pretreatment with 12.5–50 μg/ml of GEGR [Figure 2]b. Based on the above data, the effective dose 50% was determined to be 6.85 μg/ml of GEGR. Similar results were observed upon DAPI staining. Specifically, more irregular nuclei were detected in H2O2 + vehicle-treated cells relative to the control group, whereas a lower number of irregular nuclei were observed in H2O2 + GEGR-treated cells than H2O2 + vehicle-treated cells [Figure 3]. The total number of apoptotic cells showed the reverse pattern. A significant increase in the number (347%–409%) of apoptotic cells was detected in H2O2 + vehicle-treated cells relative to the control group. Following pretreatment with GEGR, the number of apoptotic cells gradually decreased although a constant number was detected in HepG2 cells pretreated with 12.5, 25, or 50 μg/ml [Figure 4]. In conclusion, these findings indicate that GEGR pretreatment may prevent the cytotoxicity induced by H2O2 treatment in HepG2 cells. To determine if the increase in apoptotic cells was accompanied by altered expression of apoptosis-related proteins, the expression levels of Bax, Bcl-2, and caspase-3 were measured by Western blot analysis in HepG2 cells pretreated with GEGR before H2O2 exposure. The Bax/Bcl-2 ratio increased by 19.8% in the H2O2 + vehicle-treated group relative to the control group, whereas it decreased significantly in the GEGR pretreated group although cells pretreated with 6.25 μg/ml of GEGR showed a slight increase in this ratio. Furthermore, a dramatic change in the active form of caspase-3 was observed. Specifically, the intensity of the active form of caspase-3 in the H2O2 + vehicle-treated group was about two times higher than that in the control group, while their level was dramatically decreased in the GEGR pretreated group relative to the H2O2 + vehicle-treated group. 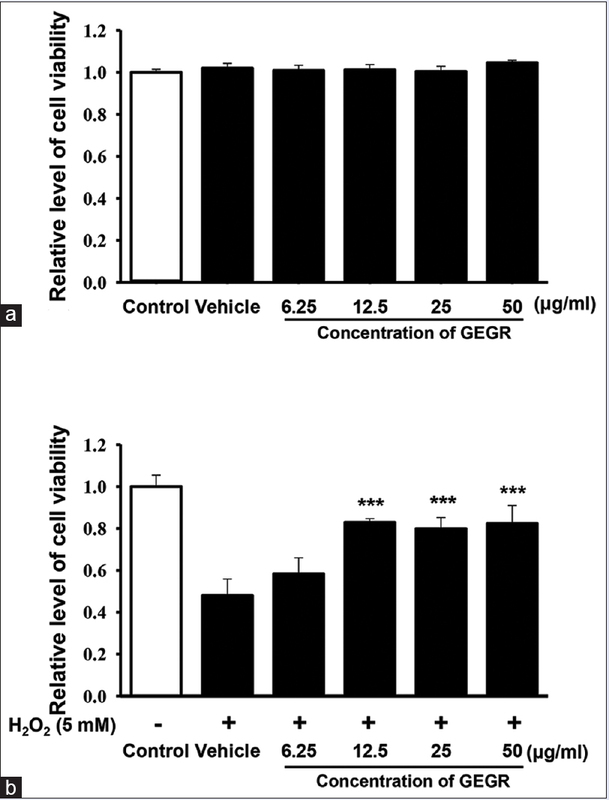 HepG2 cells pretreated with 50 μg/ml of GEGR before exposure to 5 mM H2O2 showed a similar level of active caspase-3 as observed in the control group [Figure 5]. 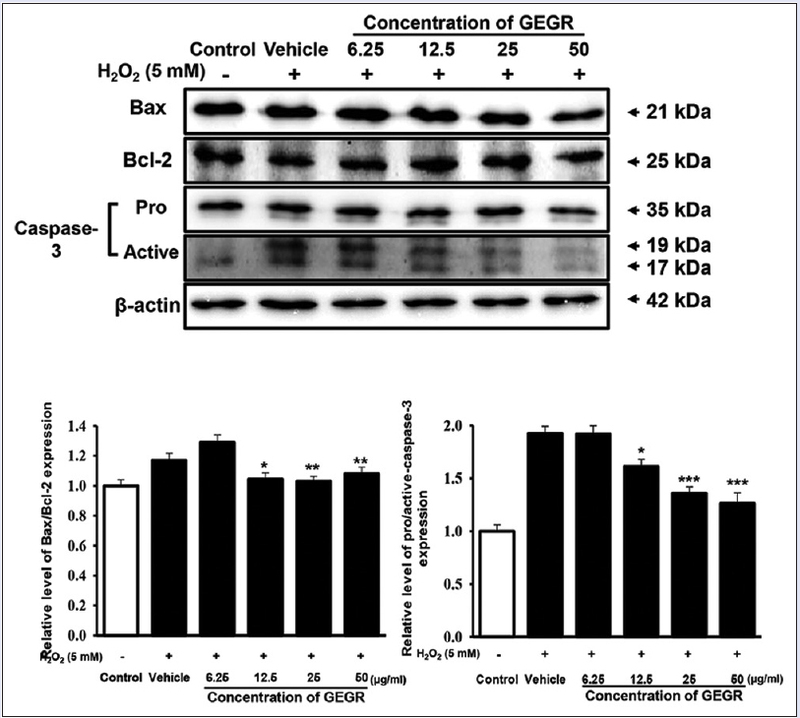 In conclusion, these results indicate that GEGR pretreatment may prevent H2O2-induced apoptosis through the regulation of Bax/Bcl-2 expression and the suppression of caspase-3 activation. To determine if the prevention of apoptosis was correlated with the suppression of ROS production, alterations in ROS level were measured by DCFH-DA assay. The number of DCFH-DA-stained cells was higher in the H2O2 + vehicle-treated group than the control group. Following GEGR pretreatment, this number decreased greatly in all groups although concentration-dependent changes were only detected in the 6.25 and 12.5 μg/ml pretreated groups. A constant level was maintained in groups pretreated with 12.5, 25, and 50 μg/ml GEGR [Figure 6]. In conclusion, these results suggest that GEGR pretreatment inhibits ROS production induced by H2O2 treatment. The liver is a greater target of human toxicants than other organs. Various toxicants induce hepatic damage, necrosis, and apoptosis, and their administration for long periods of time leads to fibrosis, cirrhosis, and hepatic carcinoma. Therefore, novel therapeutic drugs with hepatoprotective activity are of great interest. In this study, we investigated the hepatoprotective effects of GEGR against H2O2-induced cytotoxicity. The results demonstrated that pretreatment with GEGR may prevent apoptosis of HepG2 cells through suppression of caspase-3 activation and ROS production. Previous studies have shown that several compounds in methanol and ethanol extracts of GR protect against tacrine- and nitrofurantoin-induced cytotoxicity in mammalian cells. Four main compounds, gallic acid methyl ester, gallic acid, an equilibrium mixture of 3GGA + 4GGAI, and PGG were identified in methanol extract of GR. The ethanol extract of GR contained syringic acid (18.5 mg), as well as the phenolics methyl gallate (20.7 mg) and gallic acid (19.5 mg). In addition, a study conducted by Lee et al. revealed that aqueous extract of GR contained gallotannin (69.0%), gallic acid (25.7%), and methyl gallate (5.3%) and showed deodorizing function and antibacterial activity. The concentrations of these components were very similar to those observed in the present study although they did differ slightly, possibly due to the origin of the GR used. 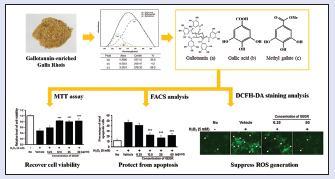 Tannic acid and its derivatives have promising hepatoprotective activity., Specifically, phlorotannins from Eisenia bicyclis that showed high contents of total phenolics and strong antioxidant activity significantly protected HepG2 cells against tert-butyl hyperoxide-induced cell death. Treatment with Punarnavashtak kwath (an Ayurvedic formulation), which contains alkaloids, tannins, flavonoids, and saponins, induced a significant increase in the viability of HepG2 cells relative to a carbon tetrachloride (CCl4)-treated group. Moreover, HepG2 cells were effectively protected against tert-butyl hyperoxide-induced cytotoxicity by treatment with ethanol extract of Ecklonia stolonifera containing several phlorotannins. Phenolic constituents namely PGG and mixture of 3GGA + 4GGAI also showed significant hepatoprotective effects against tacrine- and nitrofurantoin-induced cytotoxicity in HepG2 cells. In the present study, the gallotannin-enriched complex of GEGR exerted hepatoprotective effects against H2O2-treated HepG2 cells. Therefore, the present results provide novel evidence that the hepatotoxicity induced by H2O2 treatment may be prevented by GEGR. Capsapse-3 is considered a key factor responsible for cleavage and inactivation of PPAR, as well as mitochondrial dysfunction (caspase-9 activation) and death receptor pathway activation (caspase-8 activation) in apoptosis of hepatocytes., Treatment with PGG-inhibited production of the activated form of caspase-3 in primary rat hepatocytes treated with 100 μM glycochendeoxycholic acid. Moreover, the dose-dependent activation of caspase-3 in HepG2 cells by tacrine was inhibited by 2-phloroeckol, one of four types of phlorotannins isolated from the ethyl acetate of E. stolonifera.Similar results were observed in the present study even though the concentration and composition of treatment compounds varied. Excessive production of ROS can induce oxidative stress, cell dysfunction, and ultimately apoptosis and necrosis. Tannic acid and several related products have been reported to inhibit ROS production. Specifically, ROS production induced by tert-butyl hydroperoxide and tacrine treatment significantly inhibited the procyanidin fractions from defatted grape seeds, as well as 2-phloroeckol from E. stolonifera in HepG2 cells., In the present study, the ROS level was decreased in the H2O2 + GEGR-treated group relative to the H2O2 + vehicle-treated group. These findings are similar to those of previous studies although the decrease ratio varied. The results of the present study indicated that GEGR was closely associated with prevention of H2O2-induced HepG2 cell death through regulation of apoptosis-related protein expression. These findings also indicate that GEGR plays a crucial role in the prevention of apoptosis through inhibition of ROS production. Furthermore, GEGR has the potential for use as a food supplement for the prevention of hepatotoxicity. This study was supported by grants to Professor Dae Youn Hwang from the Korea Institute of Planning & Evaluation for Technology In Food, Agriculture, Forestry & Fisheries (114034-03-1-HD030 and 116027-3-2- HD030). Lee SM, Lee DW, Park JD, Kim JI. Study on formation and development of gall in Rhus javanica . Korean J Appl Entomol 1997;36:83-7. Ren Z, Zhu B, Wang D, Ma E, Su D, Zhong Y. Comparative population structure of Chinese sumac aphid Schlechtendalia chinensis and its primary host-plant Rhus chinensis . Genetica 2008;132:103-12. Shim YJ, Doo HK, Ahn SY, Kim YS, Seong JK, Park IS, et al. Inhibitory effect of aqueous extract from the gall of Rhus chinensis on alpha-glucosidase activity and postprandial blood glucose. J Ethnopharmacol 2003;85:283-7. Song GY, Park BJ, Kim SH. Antithrombotic effect of Galla Rhois. Korean J Pharmacogn 2002;33:120-3. Kim SH, Park HH, Lee S, Jun CD, Choi BJ, Kim SY, et al. The anti-anaphylactic effect of the gall of Rhus javanica is mediated through inhibition of histamine release and inflammatory cytokine secretion. Int Immunopharmacol 2005;5:1820-9. Ahn YJ, Lee CO, Kweon JH, Ahn JW, Park JH. Growth-inhibitory effects of Galla Rhois-derived tannins on intestinal bacteria. J Appl Microbiol 1998;84:439-43. Choi JG, Kang OH, Lee YS, Oh YC, Chae HS, Jang HJ, et al. In vitro activity of methyl gallate isolated from Galla Rhois alone and in combination with ciprofloxacin against clinical isolates of Salmonella . J Microbiol Biotechnol 2008;18:1848-52. Choi JG, Kang OH, Lee YS, Oh YC, Chae HS, Jang HJ, et al. Antibacterial activity of methyl gallate isolated from Galla Rhois or carvacrol combined with nalidixic acid against nalidixic acid resistant bacteria. Molecules 2009;14:1773-80. Choi JG, Mun SH, Chahar HS, Bharaj P, Kang OH, Kim SG, et al . Methyl gallate from Galla Rhois successfully controls clinical isolates of Salmonella infection in both in vitro and in vivo systems. PLoS One 2014;9:e102697. Available from: http://www.journals.plos.org/plosone/article?id=10.1371/journal.pone. 0102697. [Last cited on 2014 Jul 21]. Lee JJ, Bae JH, Kim DH, Lim JJ, Kim DG, Lee HJ, et al. Intracellular replication inhibitory effects of Galla Rhois ethanol extract for Brucella abortus infection. J Ethnopharmacol 2011;138:602-9. Lee JJ, Kim DH, Lim JJ, Kim DG, Min W, Kim GS, et al. Anticoccidial effect of supplemental dietary Galla Rhois against infection with Eimeria tenella in chickens. Avian Pathol 2012;41:403-7. Chae HS, Kang OH, Choi JG, Oh YC, Lee YS, Brice OO, et al. Methyl gallate inhibits the production of interleukin-6 and nitric oxide via down-regulation of extracellular-signal regulated protein kinase in RAW 264.7 cells. Am J Chin Med 2010;38:973-83. Park PH, Hur J, Kim YC, An RB, Sohn DH. Involvement of heme oxygenase-1 induction in inhibitory effect of ethyl gallate isolated from Galla Rhois on nitric oxide production in RAW 264.7 macrophages. Arch Pharm Res 2011;34:1545-52. Ata N, Oku T, Hattori M, Fujii H, Nakajima M, Saiki I. Inhibition by galloylglucose (GG6-10) of tumor invasion through extracellular matrix and gelatinase-mediated degradation of type IV collagens by metastatic tumor cells. Oncol Res 1996;8:503-11. Xiang Q, Fan C, Xiao S, Pan H, Wang J, Zhao N, et al. Effect of gallnut extract on nasopharyngeal carcinoma 5-8F cells and its mechanism. Zhong Nan Da Xue Xue Bao Yi Xue Ban 2012;37:871-5. Lee K, Kim J, Lee BJ, Park JW, Leem KH, Bu Y. Protective effects of Galla Rhois, the excrescence produced by the sumac aphid, Schlechtendalia chinensis , on transient focal cerebral ischemia in the rat. J Insect Sci 2012;12:10. An RB, Oh H, Kim YC. Phenolic constituents of Galla Rhois with hepatoprotective effects on tacrine- and nitrofurantoin-induced cytotoxicity in HepG2 cells. Biol Pharm Bull 2005;28:2155-7. Park EJ, Zhao YZ, An RB, Kim YC, Sohn DH. 1,2,3,4,6-penta-O-galloyl-beta-D-glucose from Galla Rhois protects primary rat hepatocytes from necrosis and apoptosis. Planta Med 2008;74:1380-3. Lee YH. Dyeing, fastness, and deodorizing properties of cotton, silk, and wool fabrics dyed with coffee sludge (Coffea arabica L. ) extract. J Appl Polym Sci 2007;103:251-7. Lee YH, Hwang EK, Jung YJ, Do SK, Kim HD. Dyeing and deodorizing properties of cotton, silk, wool fabrics dyed with amurcorktree, Dryopteris crassirhizoma , Chrysanthemum boreale , Artemisia extracts. J Appl Polym Sci 2010;115:2246-53. Lee YH, Hwang EK, Baek YM, Lee MS, Lee DJ, Jung YJ, et al . Deodorizing and antibacterial performance of cotton, silk and wool fabrics dyed with Punicagranatum L. extracts. Fibers Polym 2013;14:1445-53. Hwang EK, Lee YH, Kim HD. Dyeing and deodorizing properties of cotton, silk, and wool fabrics dyed with various natural colorants. J Korean Soc Dyers Finishers 2007;19:12-20. Albu MG, Ghica MV, Giurginca M, Trandafir V, Popa L, Cotrut MC. Spectral characteristics and antioxidant properties of tannic acid immobilized on collagen drug-delivery systems. Rev Chim (Bucur) 2009;60:666-72. Oh H, Ko EK, Kim DH, Jang KK, Park SE, Lee HS, et al. Secoiridoid glucosides with free radical scavenging activity from the leaves of Syringa dilatata . Phytother Res 2003;17:417-9. Emanuele S, Calvaruso G, Lauricella M, Giuliano M, Bellavia G, D'Anneo A, et al. Apoptosis induced in hepatoblastoma HepG2 cells by the proteasome inhibitor MG132 is associated with hydrogen peroxide production, expression of Bcl-XS and activation of caspase-3. Int J Oncol 2002;21:857-65. Lee JH, Lee JS, Kim YR, Jung WC, Lee KE, Lee SY, et al. Hispidin isolated from Phellinus linteus protects against hydrogen peroxide-induced oxidative stress in pancreatic MIN6N ß-cells. J Med Food 2011;14:1431-8. Siviková K, Piesová E, Dianovský J. The protection of Vitamin E and selenium against carbon tetrachloride-induced genotoxicity in ovine peripheral blood lymphocytes. Mutat Res 2001;494:135-42. Wernke MJ, Schell JD. Solvents and malignancy. Clin Occup Environ Med 2004;4:513-27, vii. Lee YH, Hwang EK, Baek YM, Kim HD. Deodorizing function and antibacterial activity of fabrics dyed with gallnut (Galla chinensis) extract. Text Res J 2015;85:1045-54. Available from: http://www.trj.sagepub.com/content/early/2014/11/27/0040517514559580. [Last cited on 2015 Apr 07]. Tikoo K, Tamta A, Ali IY, Gupta J, Gaikwad AB. Tannic acid prevents azidothymidine (AZT) induced hepatotoxicity and genotoxicity along with change in expression of PARG and histone H3 acetylation. Toxicol Lett 2008;177:90-6. Shimoda H, Tanaka J, Kikuchi M, Fukuda T, Ito H, Hatano T, et al. Walnut polyphenols prevent liver damage induced by carbon tetrachloride and d-galactosamine: hepatoprotective hydrolyzable tannins in the kernel pellicles of walnut. J Agric Food Chem 2008;56:4444-9. Kim SM, Kang K, Jeon JS, Jho EH, Kim CY, Nho CW, et al. Isolation of phlorotannins from Eisenia bicyclis and their hepatoprotective effect against oxidative stress induced by tert-butyl hyperoxide. Appl Biochem Biotechnol 2011;165:1296-307. Shah VN, Shah MB, Bhatt PA. Hepatoprotective activity of punarnavashtak kwath, an Ayurvedic formulation, against CCl4-induced hepatotoxicity in rats and on the HepG2 cell line. Pharm Biol 2011;49:408-15. Kim YC, An RB, Yoon NY, Nam TJ, Choi JS. Hepatoprotective constituents of the edible brown alga Ecklonia stolonifera on tacrine-induced cytotoxicity in HepG2 cells. Arch Pharm Res 2005;28:1376-80. Allen RT, Hunter WJ 3rd, Agrawal DK. Morphological and biochemical characterization and analysis of apoptosis. J Pharmacol Toxicol Methods 1997;37:215-28. Yoon JH, Gores GJ. Death receptor-mediated apoptosis and the liver. J Hepatol 2002;37:400-10. Lee MS, Shin T, Utsuki T, Choi JS, Byun DS, Kim HR. Isolation and identification of phlorotannins from Ecklonia stolonifera with antioxidant and hepatoprotective properties in tacrine-treated HepG2 cells. J Agric Food Chem 2012;60:5340-9. Kim Y, Choi Y, Ham H, Jeong HS, Lee J. Protective effects of oligomeric and polymeric procyanidin fractions from defatted grape seeds on tert-butyl hydroperoxide-induced oxidative damage in HepG2 cells. Food Chem 2013;137:136-41.